Since 2001, 40 non-natural amino acids have been added into protein by creating a unique codon (recoding) and a corresponding transfer-RNA:aminoacyl – tRNA-synthetase pair to encode it with diverse physicochemical and biological properties in order to be used as a tool to exploring protein structure and function or to create novel or enhanced proteins. Reading frames in the DNA sequence of a region of the human mitochondrial genome coding for the genes MT-ATP8 and MT-ATP6 (in black: positions 8,525 to 8,580 in the sequence accession NC_012920). There are three possible reading frames in the 5' → 3' forward direction, starting on the first (+1), second (+2) and third position (+3). For each codon (square brackets), the amino acid is given by the vertebrate mitochondrial code, either in the +1 frame for MT-ATP8 (in red) or in the +3 frame for MT-ATP6 (in blue). The MT-ATP8 genes terminates with the TAG stop codon (red dot) in the +1 frame. The MT-ATP6 gene starts with the ATG codon (blue circle for the M amino acid) in the +3 frame. Mutations that disrupt the reading frame sequence by indels (insertions or deletions) of a non-multiple of 3 nucleotide bases are known as frameshift mutations. These mutations usually result in a completely different translation from the original, and likely cause a stop codon to be read, which truncates the protein. These mutations may impair the protein's function and are thus rare in in vivo protein-coding sequences. One reason inheritance of frameshift mutations is rare is that, if the protein being translated is essential for growth under the selective pressures the organism faces, absence of a functional protein may cause death before the organism becomes viable. Frameshift mutations may result in severe genetic diseases such as Tay–Sachs disease. 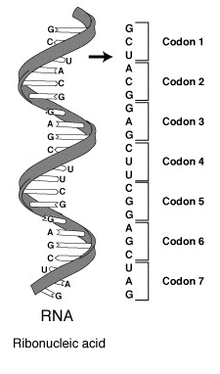 A The codon AUG both codes for methionine and serves as an initiation site: the first AUG in an mRNA's coding region is where translation into protein begins. The other start codons listed by GenBank are rare in eukaryotes and generally codes for Met/fMet. Variations on the standard code were predicted in the 1970s. The first was discovered in 1979, by researchers studying human mitochondrial genes. Many slight variants were discovered thereafter, including various alternative mitochondrial codes. These minor variants for example involve translation of the codon UGA as tryptophan in Mycoplasma species, and translation of CUG as a serine rather than leucine in yeasts of the "CTG clade" (such as Candida albicans). Because viruses must use the same genetic code as their hosts, modifications to the standard genetic code could interfere with viral protein synthesis or functioning. However, viruses such as totiviruses have adapted to the host's genetic code modification. In bacteria and archaea, GUG and UUG are common start codons. In rare cases, certain proteins may use alternative start codons. Surprisingly, variations in the interpretation of the genetic code exist also in human nuclear-encoded genes: In 2016, researchers studying the translation of malate dehydrogenase found that in about 4% of the mRNAs encoding this enzyme the stop codon is naturally used to encode the amino acids tryptophan and arginine. This type of recoding is induced by a high-readthrough stop codon context and it is referred to as functional translational readthrough. Blepharisma nuclear 15 TAG UAG Gln (Q) Ter (*) As of Nov. 18, 2016: absent from the NCBI update. Similar to 6. Cephalodiscidae mitochondrial code 33 AGA AGA Ser (S) Arg (R) Similar to translation table 24. ^ Shu, Jian-Jun (2017). "A new integrated symmetrical table for genetic codes". BioSystems. 151: 21–26. arXiv:1703.03787. doi:10.1016/j.biosystems.2016.11.004. PMID 27887904. ^ Turanov AA, Lobanov AV, Fomenko DE, Morrison HG, Sogin ML, Klobutcher LA, Hatfield DL, Gladyshev VN (January 2009). "Genetic code supports targeted insertion of two amino acids by one codon". Science. 323 (5911): 259–61. doi:10.1126/science.1164748. PMC 3088105. PMID 19131629. ^ Crick, Francis (10 July 1990). "Chapter 8: The genetic code". What Mad Pursuit: A Personal View of Scientific Discovery. Basic Books. pp. 89–101. ISBN 978-0-465-09138-6. ^ Nirenberg MW, Matthaei JH (October 1961). "The dependence of cell-free protein synthesis in E. coli upon naturally occurring or synthetic polyribonucleotides". Proceedings of the National Academy of Sciences of the United States of America. 47 (10): 1588–602. Bibcode:1961PNAS...47.1588N. doi:10.1073/pnas.47.10.1588. PMC 223178. PMID 14479932. ^ Gardner RS, Wahba AJ, Basilio C, Miller RS, Lengyel P, Speyer JF (December 1962). "Synthetic polynucleotides and the amino acid code. VII". Proceedings of the National Academy of Sciences of the United States of America. 48 (12): 2087–94. Bibcode:1962PNAS...48.2087G. doi:10.1073/pnas.48.12.2087. PMC 221128. PMID 13946552. ^ Wahba AJ, Gardner RS, Basilio C, Miller RS, Speyer JF, Lengyel P (January 1963). "Synthetic polynucleotides and the amino acid code. VIII". Proceedings of the National Academy of Sciences of the United States of America. 49 (1): 116–22. Bibcode:1963PNAS...49..116W. doi:10.1073/pnas.49.1.116. PMC 300638. PMID 13998282. ^ "The Nobel Prize in Physiology or Medicine 1959" (Press release). The Royal Swedish Academy of Science. 1959. Retrieved 27 February 2010. The Nobel Prize in Physiology or Medicine 1959 was awarded jointly to Severo Ochoa and Arthur Kornberg 'for their discovery of the mechanisms in the biological synthesis of ribonucleic acid and deoxyribonucleic acid'. ^ "The Nobel Prize in Physiology or Medicine 1968" (Press release). The Royal Swedish Academy of Science. 1968. Retrieved 27 February 2010. The Nobel Prize in Physiology or Medicine 1968 was awarded jointly to Robert W. Holley, Har Gobind Khorana and Marshall W. Nirenberg 'for their interpretation of the genetic code and its function in protein synthesis'. ^ Edgar B (October 2004). "The genome of bacteriophage T4: an archeological dig". Genetics. 168 (2): 575–82. PMC 1448817. PMID 15514035. ^ Budisa, Nediljko (23 December 2005). The book at the Wiley Online Library. doi:10.1002/3527607188. ISBN 9783527312436. ^ Kubyshkin, V.; Budisa, N. (2017). "Synthetic alienation of microbial organisms by using genetic code engineering: Why and how?". Biotechnologie Journal. 12 (8): 1600097. doi:10.1002/biot.201600097. PMID 28671771. ^ Xie J, Schultz PG (December 2005). "Adding amino acids to the genetic repertoire". Current Opinion in Chemical Biology. 9 (6): 548–54. doi:10.1016/j.cbpa.2005.10.011. PMID 16260173. ^ Simon M (7 January 2005). Emergent Computation: Emphasizing Bioinformatics. Springer Science & Business Media. pp. 105–106. ISBN 978-0-387-22046-8. ^ "First stable semisynthetic organism created | KurzweilAI". www.kurzweilai.net. 3 February 2017. Retrieved 9 February 2017. ^ Zhang Y, Lamb BM, Feldman AW, Zhou AX, Lavergne T, Li L, Romesberg FE (February 2017). "A semisynthetic organism engineered for the stable expansion of the genetic alphabet". Proceedings of the National Academy of Sciences of the United States of America. 114 (6): 1317–1322. doi:10.1073/pnas.1616443114. PMC 5307467. PMID 28115716. ^ Han S, Yang A, Lee S, Lee HW, Park CB, Park HS (February 2017). "Expanding the genetic code of Mus musculus". Nature Communications. 8: 14568. Bibcode:2017NatCo...814568H. doi:10.1038/ncomms14568. PMC 5321798. PMID 28220771. ^ Homo sapiens mitochondrion, complete genome. "Revised Cambridge Reference Sequence (rCRS): accession NC_012920", National Center for Biotechnology Information. Retrieved on 27 December 2017. ^ a b King RC, Mulligan P, Stansfield W (10 January 2013). A Dictionary of Genetics. OUP USA. p. 608. ISBN 978-0-19-976644-4. ^ Touriol C, Bornes S, Bonnal S, Audigier S, Prats H, Prats AC, Vagner S (2003). "Generation of protein isoform diversity by alternative initiation of translation at non-AUG codons". Biology of the Cell / Under the Auspices of the European Cell Biology Organization. 95 (3–4): 169–78. doi:10.1016/S0248-4900(03)00033-9. PMID 12867081. ^ Maloy S (29 November 2003). "How nonsense mutations got their names". Microbial Genetics Course. San Diego State University. Retrieved 10 March 2010. ^ Griffiths AJ, Miller JH, Suzuki DT, Lewontin RC, et al., eds. (2000). "Spontaneous mutations". An Introduction to Genetic Analysis (7th ed.). New York: W. H. Freeman. ISBN 978-0-7167-3520-5. ^ Freisinger E, Grollman AP, Miller H, Kisker C (April 2004). "Lesion (in)tolerance reveals insights into DNA replication fidelity". The EMBO Journal. 23 (7): 1494–505. doi:10.1038/sj.emboj.7600158. PMC 391067. PMID 15057282. ^ Chang JC, Kan YW (June 1979). "beta 0 thalassemia, a nonsense mutation in man". Proceedings of the National Academy of Sciences of the United States of America. 76 (6): 2886–9. Bibcode:1979PNAS...76.2886C. doi:10.1073/pnas.76.6.2886. PMC 383714. PMID 88735. ^ Boillée S, Vande Velde C, Cleveland DW (October 2006). "ALS: a disease of motor neurons and their nonneuronal neighbors". Neuron. 52 (1): 39–59. doi:10.1016/j.neuron.2006.09.018. PMID 17015226. ^ Isbrandt D, Hopwood JJ, von Figura K, Peters C (1996). "Two novel frameshift mutations causing premature stop codons in a patient with the severe form of Maroteaux-Lamy syndrome". Human Mutation. 7 (4): 361–3. doi:10.1002/(SICI)1098-1004(1996)7:4<361::AID-HUMU12>3.0.CO;2-0. PMID 8723688. ^ Crow JF (1993). "How much do we know about spontaneous human mutation rates?". Environmental and Molecular Mutagenesis. 21 (2): 122–9. doi:10.1002/em.2850210205. PMID 8444142. ^ Lewis R (2005). Human Genetics: Concepts and Applications (6th ed.). Boston, Mass: McGraw Hill. pp. 227–228. ISBN 978-0-07-111156-0. ^ Sawyer SA, Parsch J, Zhang Z, Hartl DL (April 2007). "Prevalence of positive selection among nearly neutral amino acid replacements in Drosophila". Proceedings of the National Academy of Sciences of the United States of America. 104 (16): 6504–10. Bibcode:2007PNAS..104.6504S. doi:10.1073/pnas.0701572104. PMC 1871816. PMID 17409186. ^ Bridges KR (2002). "Malaria and the Red Cell". Harvard. Archived from the original on 27 November 2011. ^ Drake JW, Holland JJ (November 1999). "Mutation rates among RNA viruses". Proceedings of the National Academy of Sciences of the United States of America. 96 (24): 13910–3. Bibcode:1999PNAS...9613910D. doi:10.1073/pnas.96.24.13910. PMC 24164. PMID 10570172. ^ Holland J, Spindler K, Horodyski F, Grabau E, Nichol S, VandePol S (March 1982). "Rapid evolution of RNA genomes". Science. 215 (4540): 1577–85. Bibcode:1982Sci...215.1577H. doi:10.1126/science.7041255. PMID 7041255. ^ de Visser JA, Rozen DE (April 2006). "Clonal interference and the periodic selection of new beneficial mutations in Escherichia coli". Genetics. 172 (4): 2093–100. doi:10.1534/genetics.105.052373. PMC 1456385. PMID 16489229. ^ Watson, James D. (2008). Molecular Biology of the Gene. Pearson/Benjamin Cummings. ISBN 978-0-8053-9592-1. ^ Michel-Beyerle, Maria Elisabeth (1990). Reaction centers of photosynthetic bacteria: Feldafing-II-Meeting. Springer-Verlag. ISBN 978-3-540-53420-4. ^ Füllen G, Youvan DC (1994). "Genetic Algorithms and Recursive Ensemble Mutagenesis in Protein Engineering". Complexity International 1. ^ Fricke, Markus (7 August 2018). "Global importance of RNA secondary structures in protein coding sequences". Bioinformatics. 35 (4): 579–583. doi:10.1093/bioinformatics/bty678. PMID 30101307. ^ Nakamoto T (March 2009). "Evolution and the universality of the mechanism of initiation of protein synthesis". Gene. 432 (1–2): 1–6. doi:10.1016/j.gene.2008.11.001. PMID 19056476. ^ Blattner, F. R.; Plunkett g, G.; Bloch, C. A.; Perna, N. T.; Burland, V.; Riley, M.; Collado-Vides, J.; Glasner, J. D.; Rode, C. K.; Mayhew, G. F.; Gregor, J.; Davis, N. W.; Kirkpatrick, H. A.; Goeden, M. A.; Rose, D. J.; Mau, B.; Shao, Y. (1997). "The Complete Genome Sequence of Escherichia coli K-12". Science. 277 (5331): 1453–1462. doi:10.1126/science.277.5331.1453. PMID 9278503. ^ a b c Elzanowski A, Ostell J (7 April 2008). "The Genetic Codes". National Center for Biotechnology Information (NCBI). Retrieved 10 March 2010. ^ Krzycki JA (December 2005). "The direct genetic encoding of pyrrolysine". Current Opinion in Microbiology. 8 (6): 706–12. doi:10.1016/j.mib.2005.10.009. PMID 16256420. ^ Zhang Y, Baranov PV, Atkins JF, Gladyshev VN (May 2005). "Pyrrolysine and selenocysteine use dissimilar decoding strategies". The Journal of Biological Chemistry. 280 (21): 20740–51. doi:10.1074/jbc.M501458200. PMID 15788401. ^ Prat L, Heinemann IU, Aerni HR, Rinehart J, O'Donoghue P, Söll D (December 2012). "Carbon source-dependent expansion of the genetic code in bacteria". Proceedings of the National Academy of Sciences of the United States of America. 109 (51): 21070–5. Bibcode:2012PNAS..10921070P. doi:10.1073/pnas.1218613110. PMC 3529041. PMID 23185002. ^ Jukes TH, Osawa S (December 1990). "The genetic code in mitochondria and chloroplasts". Experientia. 46 (11–12): 1117–26. doi:10.1007/BF01936921. PMID 2253709. ^ Fitzpatrick DA, Logue ME, Stajich JE, Butler G (1 January 2006). "A fungal phylogeny based on 42 complete genomes derived from supertree and combined gene analysis". BMC Evolutionary Biology. 6: 99. doi:10.1186/1471-2148-6-99. PMC 1679813. PMID 17121679. ^ Santos MA, Tuite MF (May 1995). "The CUG codon is decoded in vivo as serine and not leucine in Candida albicans". Nucleic Acids Research. 23 (9): 1481–6. doi:10.1093/nar/23.9.1481. PMC 306886. PMID 7784200. ^ Butler G, Rasmussen MD, Lin MF, et al. (June 2009). "Evolution of pathogenicity and sexual reproduction in eight Candida genomes". Nature. 459 (7247): 657–62. Bibcode:2009Natur.459..657B. doi:10.1038/nature08064. PMC 2834264. PMID 19465905. ^ Taylor DJ, Ballinger MJ, Bowman SM, Bruenn JA (2013). "Virus-host co-evolution under a modified nuclear genetic code". PeerJ. 1: e50. doi:10.7717/peerj.50. PMC 3628385. PMID 23638388. ^ F. Schueren und S. Thoms (2016). "Functional Translational Readthrough: A Systems Biology Perspective". PLOS Genetics. 12 (8): e1006196. doi:10.1371/journal.pgen.1006196. PMC 4973966. PMID 27490485. ^ Dutilh BE, Jurgelenaite R, Szklarczyk R, van Hijum SA, Harhangi HR, Schmid M, de Wild B, Françoijs KJ, Stunnenberg HG, Strous M, Jetten MS, Op den Camp HJ, Huynen MA (July 2011). "FACIL: Fast and Accurate Genetic Code Inference and Logo". Bioinformatics. 27 (14): 1929–33. doi:10.1093/bioinformatics/btr316. PMC 3129529. PMID 21653513. ^ Kubyshkin, V.; Acevedo-Rocha, C. G.; Budisa, N. (2017). "On universal coding events in protein biogenesis". Biosystems. 164: 16–25. doi:10.1016/j.biosystems.2017.10.004. PMID 29030023. ^ Ribas de Pouplana L, Turner RJ, Steer BA, Schimmel P (September 1998). "Genetic code origins: tRNAs older than their synthetases?". Proceedings of the National Academy of Sciences of the United States of America. 95 (19): 11295–300. Bibcode:1998PNAS...9511295D. doi:10.1073/pnas.95.19.11295. PMC 21636. PMID 9736730. ^ a b Yarus, Michael (2010). Life from an RNA World: The Ancestor Within. Harvard University Press. ISBN 978-0-674-05075-4. ^ "Mathematica function for # possible arrangements of items in bins? – Online Technical Discussion Groups—Wolfram Community". community.wolfram.com. Retrieved 3 February 2017. ^ a b Freeland SJ, Hurst LD (September 1998). "The genetic code is one in a million". Journal of Molecular Evolution. 47 (3): 238–48. Bibcode:1998JMolE..47..238F. doi:10.1007/PL00006381. PMID 9732450. ^ Taylor FJ, Coates D (1989). "The code within the codons". Bio Systems. 22 (3): 177–87. doi:10.1016/0303-2647(89)90059-2. PMID 2650752. ^ Di Giulio M (October 1989). "The extension reached by the minimization of the polarity distances during the evolution of the genetic code". Journal of Molecular Evolution. 29 (4): 288–93. Bibcode:1989JMolE..29..288D. doi:10.1007/BF02103616. PMID 2514270. ^ Wong JT (February 1980). "Role of minimization of chemical distances between amino acids in the evolution of the genetic code". Proceedings of the National Academy of Sciences of the United States of America. 77 (2): 1083–6. Bibcode:1980PNAS...77.1083W. doi:10.1073/pnas.77.2.1083. PMC 348428. PMID 6928661. ^ a b c d Erives A (August 2011). "A model of proto-anti-codon RNA enzymes requiring L-amino acid homochirality". Journal of Molecular Evolution. 73 (1–2): 10–22. Bibcode:2011JMolE..73...10E. doi:10.1007/s00239-011-9453-4. PMC 3223571. PMID 21779963. ^ a b Freeland SJ, Knight RD, Landweber LF, Hurst LD (April 2000). "Early fixation of an optimal genetic code". Molecular Biology and Evolution. 17 (4): 511–18. doi:10.1093/oxfordjournals.molbev.a026331. PMID 10742043. ^ Crick FH (December 1968). "The origin of the genetic code". Journal of Molecular Evolution. 38 (3): 367–79. doi:10.1016/0022-2836(68)90392-6. PMID 4887876. ^ Hopfield JJ (1978). "Origin of the genetic code: a testable hypothesis based on tRNA structure, sequence, and kinetic proofreading". PNAS. 75 (9): 4334–4338. Bibcode:1978PNAS...75.4334H. doi:10.1073/pnas.75.9.4334. PMC 336109. PMID 279919. ^ a b Yarus M, Widmann JJ, Knight R (November 2009). "RNA-amino acid binding: a stereochemical era for the genetic code". Journal of Molecular Evolution. 69 (5): 406–29. Bibcode:2009JMolE..69..406Y. doi:10.1007/s00239-009-9270-1. PMID 19795157. ^ Knight RD, Freeland SJ, Landweber LF (June 1999). "Selection, history and chemistry: the three faces of the genetic code" (PDF). Trends in Biochemical Sciences. 24 (6): 241–7. doi:10.1016/S0968-0004(99)01392-4. PMID 10366854. ^ Knight RD, Landweber LF (September 1998). "Rhyme or reason: RNA-arginine interactions and the genetic code". Chemistry & Biology. 5 (9): R215–20. doi:10.1016/S1074-5521(98)90001-1. PMID 9751648. ^ Sengupta S, Higgs PG (2015). "Pathways of genetic code evolution in ancient and modern organisms". Journal of Molecular Evolution. 80 (5–6): 229–243. Bibcode:2015JMolE..80..229S. doi:10.1007/s00239-015-9686-8. PMID 26054480. ^ Brooks DJ, Fresco JR, Lesk AM, Singh M (October 2002). "Evolution of amino acid frequencies in proteins over deep time: inferred order of introduction of amino acids into the genetic code". Molecular Biology and Evolution. 19 (10): 1645–55. doi:10.1093/oxfordjournals.molbev.a003988. PMID 12270892. ^ Amirnovin R (May 1997). "An analysis of the metabolic theory of the origin of the genetic code". Journal of Molecular Evolution. 44 (5): 473–6. Bibcode:1997JMolE..44..473A. doi:10.1007/PL00006170. PMID 9115171. ^ Ronneberg TA, Landweber LF, Freeland SJ (December 2000). "Testing a biosynthetic theory of the genetic code: fact or artifact?". Proceedings of the National Academy of Sciences of the United States of America. 97 (25): 13690–5. Bibcode:2000PNAS...9713690R. 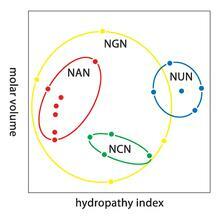 doi:10.1073/pnas.250403097. PMC 17637. PMID 11087835. ^ a b Freeland SJ, Wu T, Keulmann N (October 2003). "The case for an error minimizing standard genetic code". Origins of Life and Evolution of the Biosphere. 33 (4–5): 457–77. doi:10.1023/A:1025771327614. PMID 14604186. ^ Baranov PV, Venin M, Provan G (2009). Gemmell NJ (ed.). "Codon size reduction as the origin of the triplet genetic code". PLOS ONE. 4 (5): e5708. Bibcode:2009PLoSO...4.5708B. doi:10.1371/journal.pone.0005708. PMC 2682656. PMID 19479032. ^ Tlusty T (November 2007). "A model for the emergence of the genetic code as a transition in a noisy information channel". Journal of Theoretical Biology. 249 (2): 331–42. arXiv:1007.4122. doi:10.1016/j.jtbi.2007.07.029. PMID 17826800. ^ Sonneborn TM (1965). Bryson V, Vogel H (eds.). Evolving genes and proteins. New York: Academic Press. pp. 377–397. ^ Tlusty T (February 2008). "Rate-distortion scenario for the emergence and evolution of noisy molecular codes". Physical Review Letters. 100 (4): 048101. arXiv:1007.4149. Bibcode:2008PhRvL.100d8101T. doi:10.1103/PhysRevLett.100.048101. PMID 18352335. ^ Sella G, Ardell DH (September 2006). "The coevolution of genes and genetic codes: Crick's frozen accident revisited". Journal of Molecular Evolution. 63 (3): 297–313. Bibcode:2006JMolE..63..297S. doi:10.1007/s00239-004-0176-7. PMID 16838217. ^ Tlusty T (September 2010). "A colorful origin for the genetic code: information theory, statistical mechanics and the emergence of molecular codes". Physics of Life Reviews. 7 (3): 362–76. arXiv:1007.3906. Bibcode:2010PhLRv...7..362T. doi:10.1016/j.plrev.2010.06.002. PMID 20558115. ^ Jee J, Sundstrom A, Massey SE, Mishra B (November 2013). "What can information-asymmetric games tell us about the context of Crick's 'frozen accident'?". Journal of the Royal Society, Interface / The Royal Society. 10 (88): 20130614. doi:10.1098/rsif.2013.0614. PMC 3785830. PMID 23985735. ^ Itzkovitz S, Alon U (2007). "The genetic code is nearly optimal for allowing additional information within protein-coding sequences". Genome Research. 17 (4): 405–412. doi:10.1101/gr.5987307. PMC 1832087. PMID 17293451. Caskey CT, Leder P (April 2014). "The RNA code: nature's Rosetta Stone". Proceedings of the National Academy of Sciences of the United States of America. 111 (16): 5758–9. Bibcode:2014PNAS..111.5758C. doi:10.1073/pnas.1404819111. PMC 4000803. PMID 24756939.